In big block caps on the back of the book. With Rowling's name being very much more prominent. But it's very clear that Rowling didn't actually write the play. It would appear that JKR co-authored the play's story (which presumably includes character creation) but Jack Thorne wrote the actual play. Consultation was held at each stage of the play's development, with Jack Thorne was responsible for the actual dialogue with John Tiffany responsible for the staging. JKR would provide extensive notes but doesn't seem to have done rewrites. John Tiffany: Jo Rowling was incredibly generous. I met her first, and I already had a soft spot for her because she used to write in the cafe of the Traverse Theater in Edinburgh when I was the director. It was only after the first book came out that I realized it had been her, nursing one cappuccino for four hours. When we met to talk about the play, she asked, “What do you think the Harry Potter stories are about?” I said, “Learning to deal with death and grief.” There was something in her eye — I thought, we didn’t say it’s about transformation or magic or flying on brooms, and we’re on the right track. Thorne: We all met in Edinburgh and as the day developed, we knew we would take the epilogue of “Harry Potter and the Deathly Hallows” as a starting point. Tiffany: All the seeds are there; we start with that scene in the train station. Am I allowed to say that? Anyway, it was clear that she was going to let us take those characters and have our own ideas. Callender: Of course, Jack came to the table with an encyclopedic knowledge of Harry, so that helped. Thorne: All right, I’m a nerd. With abandonment issues. Q. Did you really sketch out the whole arc of the story in that first meeting? Tiffany: There are parts of the story, which when we first conceived them, I didn’t think she would let us do, but she never hesitated. It is one thing to let us continue the story, another to let us unravel the canon. John Tiffany explains: "We didn’t start writing the play – or Jack didn’t – until we’d agreed on what that story was." Jack Thorne then started on writing the script that is soon to be published in (script)book form. The three of them set the plot that day in J.K. Rowling’s writing room. They strung together the narrative then and there in notebooks and then Jack and John flew back to London to get started. Based on what Rowling has said in interviews, it would seem that the original idea was created by Jack Thorne, John Tiffany, Sonia Friedman, and Colin Callender before Rowling was even involved. Like by most of the other licensed works Rowling was on the creative team and had veto power, but her main contribution seems to be sharing her pre-existing notes on the next-generation with the creative team. Rowling originally had not wanted to make a stage adaptation. 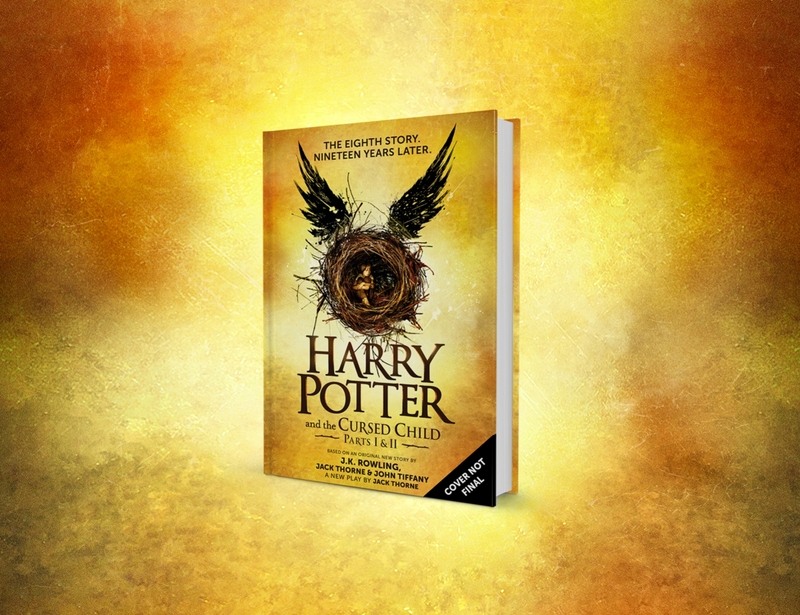 Producers Sonia Friedman and Colin Callender came up with the idea for The Cursed Child and successfully pitched it to Rowling. Over the years I have received countless approaches about turning Harry Potter into a theatrical production, but Sonia and Colin’s vision was the only one that really made sense to me, and which had the sensitivity, intensity and intimacy I thought appropriate for bringing Harry's story to the stage. After a year in gestation it is exciting to see this project moving on to the next phase. I’d like to thank Warner Bros. for their continuing support in this project. You also announced that you're going to collaborate on a theatre production. J.K. Rowling: Yes that was a really interesting idea that Sonia Friedman came up with. I've been so resistant for a long time about theatre productions. Quite a few people wanted to do a Harry Potter musical. I didn't really see Harry as a musical so we said no to all of that, but Sonia came along with a very thoughtful, very interesting idea. I'm quite excited about that. Why a play? Was it J. K. Rowling’s idea? Sonia Friedman: It was absolutely Colin’s and my idea. We knew that many other producers had approached her and she had rejected their pitches. But that’s because they were all ideas about musicals or arena spectacles. We went to her with the simple idea of a straight play. We were clear we didn’t want to adapt a novel, and we suggested exploring how Harry, an orphan, would cope as an adult and a parent. Speaking at the opening gala of Harry Potter And The Cursed Child in the West End, the author said finally agreeing to go ahead with a stage show had been a "daunting" prospect. She said: "I think I've had probably three offers a week for the past decade to do either a musical or a play or an ice show or an opera - you name it, I've been asked to do it." She said meeting producer Sonia Friedman - whose credits include The Book Of Mormon and Funny Girl - convinced her that "this is the one". Sonia Friedman: She had no intention of doing a theater show, but we when explained what we wanted to do, and how we were going to do it, she seemed to be fine. Colin Calindar: You know, we didn't talk story, we didn't talk about plot. John Tiffany: I was approached by Sonia and Colin, and they told me that they'd been to meet with Jo, and Jo had given them the okay to move forward with the idea of putting Harry onstage and exploring the adult Harry, and specifically looking at what happened to somebody who'd had the childhood that Harry had, and how he then became a parent, a father himself. The general idea for the play was then thought out by director Jack Tiffany and writer John Thorne with Rowling's help. Thorne did all the writing, with Rowling merely approving it. J.K. Rowling: Meeting Sonya Friedman, Jack Thorne and John Tiffany changed my mind. I knew there was other material there, I gave it all to them and they've turned out the play. His [Jack Thorne's] involvement in Potter came through Let the Right One In’s director, John Tiffany, and the producer Sonia Friedman, who recommended Thorne to J K Rowling. Tiffany and Thorne trooped off to see Rowling and find what new material they could develop for Thorne to script. They came up with the idea of a sequel tracking the adventures of Harry’s son Albus and his best friend, Scorpius Malfoy. I would love to be with you tonight to accept this award alongside my co-collaborators, but something else was happening in the Wizarding World on the other side of the Atlantic. I am incredibly proud of Harry Potter and the Cursed Child, but Jack Thorne and John Tiffany must take all credit for shaping and crafting it from the very very first story into something very special. My endless thanks to them. She was clear from the beginning that she was not a playwright and wouldn’t write it, and that she would only do it if we found a playwright she approved. Jack Thorne: ‏I'm stuck - and this is the point when I normally e-mail you! J.K. Rowling: And I say 'oh God, I had that problem in Goblet', fail to offer any decent solution and you do it! Just to say that this a show actually written by an awful lot of people. A lot of people who you have seen come up tonight, a lot you haven’t. I feel very, very privileged to be apart of it. Thank you Sonia, thank you Collin, thank you, thank you, John Tiffany. The ideas for the books came from you. The ideas for the movies came from the books. This was extending the story into the future. Who did that? Which of the three of you was most responsible for the storyline as it weaves its way into the future? J.K. Rowling: The developing the story, I think, was very collaborative between the three of us. I, for obvious reasons, had power of veto over everything. I could say, "No, that didn't happen." But no, it was the three of us. But the play is Jack's play. Jack did the writing. Jack did the heavy lifting. And he did it beautifully. And I couldn't be happier. Not the answer you're looking for? Browse other questions tagged harry-potter jk-rowling the-cursed-child or ask your own question.